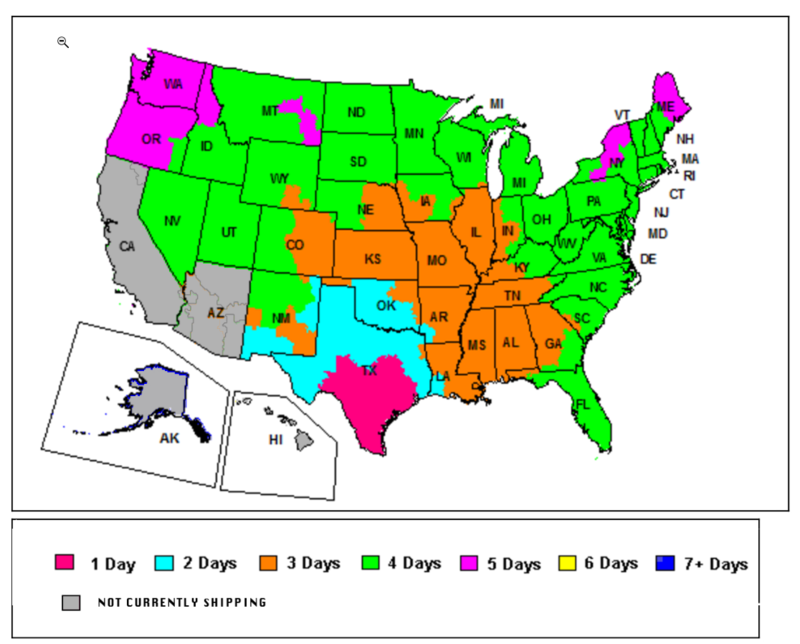 The map below is a general representation of transit times for FedEx Ground shipments to commercial destinations. In limited areas, transit times may differ between shipments to commercial and residential destinations. FedEx Business delivery days via Ground are Monday through Friday (excluding holidays). Signature confirmation verifies receipt of shipment from someone at the delivery address. Delivery is by the end of the business day. FedEx Home delivery days via Ground are Tuesday through Saturday (excluding holidays). FedEx driver may leave shipment at recipient’s door step or neighbor’s home if recipient does not answer door summon. Delivery is between 9:00 A.M. & 8:00 P.M. Extra charge according to weight & zip code destination. A package shipped via FedEx Business or Home Delivery Ground on Monday with a transit schedule of 2 business days, (not including the day the package is shipped) would be expected for delivery on Wednesday. A package shipped via FedEx Home Delivery Ground on Monday with a transit schedule of 5 days, (not including the day the package is shipped) would be expected for delivery on Saturday. The buyer is responsible to provide correct shipping address information for recipient, including zip codes. The buyer is responsible to know the gift recipient will be in town to receive shipment. If FedEx is unable to deliver a shipment because the buyer-provided address is incorrect or is a P.O. Box, or recipient is unavailable to receive shipment, South Tex Organics’ guarantee does not apply to these shipments, and we are not liable for failing to complete delivery or meet our scheduled delivery time.